Socrates once said, “the hottest love has the coldest end”. As Valentine’s Day 2018 has come and gone, it might be worthwhile to examine relationships — in relation to start-ups, of course — that didn’t have a fairy-tale ending. Having the right co- founder(s) is essential to a start-up’s success. Based on the Start-up Genome Project, a comprehensive study on what contributes to a start-ups’ success, a balanced team of co-founders raise 30% more money. Solo founders also take 3.6 times longer to reach the scale stage compared to a team with two founders. In addition, CB Insights’ post mortem report on why start-ups fail has identified negative team dynamics as the third most popular reason why start- ups don’t have a “happily ever after” ending. The Genesis Centre has always prided itself by surrounding its entrepreneurs with valuable partners, as well as reputable thought leaders in the province. For this post, we’ve reached out to Natalie Hand, Partner at Meridia Recruitment Solutions, for her thoughts regarding this matter. Why is finding the right co-founder(s) essential to a start-up’s success? It’s no secret that its people are the key to a company’s success. The results that come from having the right talent in the right chairs are limitless. This is especially true when identifying a co-founder. It is this relationship that will form the foundation for the business, weather countless challenges and opportunities and ultimately drive its success. 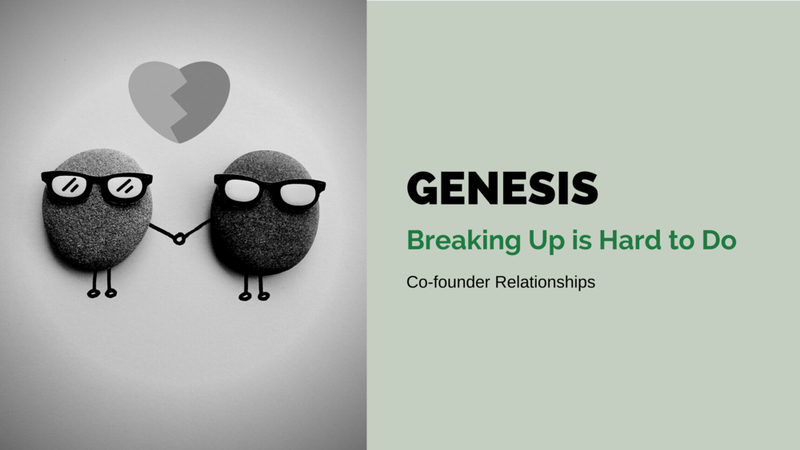 What are the negative consequences that may arise when finding the wrong co-founder(s)? Just as the right partnership creates momentum, the wrong one can be distracting and draining, especially on financial and emotional resources. Co-founders do not need to always agree on every detail or decision, but they do need to be aligned on values, principles, and a common vision. When they do not the business will suffer. What best practices should start-ups undertake when it comes to recruiting a co-founder(s)? First, consider what you need in your partner(s); what expertise you’re lacking, what gaps a founder could fill, and what skills will complement yours in what you want to accomplish. Due diligence to determine fit is essential. Like-minded entrepreneurs will be attracted and excited to become involved with a start-up if they feel their interests align. That excitement is contagious, but beyond that, ensuring you can work well with and trust the person you select is key. Have an up-front and honest dialogue with those you are considering and understand their motivation, knowledge base, strengths and perhaps most important, their weaknesses. Discuss your goals for the business and how you want to get there. Lastly, suggest that your advisors or mentors meet with your potential founder as well. Most often these discussions will lead to great clarity, openness and will solidify the relationship. If any red flags arise out of these conversations, look at them closely. Never ignore your gut.